One of the best ways to help you stay focused on your weight loss goals is to document and share your progress . . . and a great platform for that is through blogging!! -keep you accountable. If you know that people are watching you and waiting for a weigh in update or wondering what you ate for lunch, chances are you will make the right choices. -helps you connect with others who are also making your same journey or WANT to make the journey. Chances are that they will inspire you as much as you inspire them and by having a supportive community around you, chances are that you will stick with your plan to reach your goals. -gives you an outlet. Weight loss and fitness is HARD. There are days when you will want to throw in the towel. By expressing these feelings on your blog, you can better sort through your feelings and find the underlying issues. It’s practically free therapy! -can also provide an additional source of income. So many people who have shared their weight loss stories have turned their blog into a part-time or full-time income . . . but whether you are in this to make money or not, I highly recommend starting a blog as the perfect place to document your progress. So, let’s get your blog started!!! I have broken it down into easy steps and if you follow them, you will have a blog all set up and ready to go in a matter of minutes! Getting it set up is pretty simple – and we have made it even more simple by providing step-by-step directions to get you going! Even with little computer experience, you can set up your own blog in no time. By the end of this tutorial, you will have your own self-hosted WordPress site, which is one of the most common and most user-friendly sites to have (and what we use!). Some of the links included in this post are affiliate links, which means that at no additional cost to you, we will earn a commission if you choose to make a purchase. Thank you for your support in this way. After that, you will be ready to go! Let’s get started! The first thing that you need to do is purchase hosting. A host provides server space for your website so that people can find you on the internet. To explain it in simpler terms: if your website was a car, the host would be a garage (or a place to park your website). We recommend getting started with a self-hosted WordPress site (instead of a free service like Blogger or WordPress.com) because it gives you the most control over your site and it will save you headache down the road so that you don’t have to transfer everything over (which is what we had to do and it was crazy!). Trust us – you will be grateful that you started out with a self-hosted site! To get started, CLICK HERE TO GO TO BLUEHOST (this link will open in a new window, so you can still follow the instructions as you get set up). 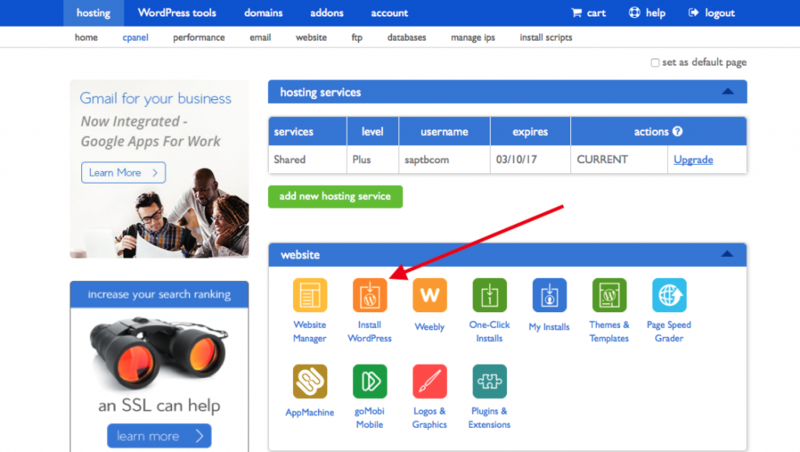 We love Bluehost hosting because of their amazing customer service, quality hosting, and great prices – and it comes with a free domain name! Click on the green GET STARTED NOW button. 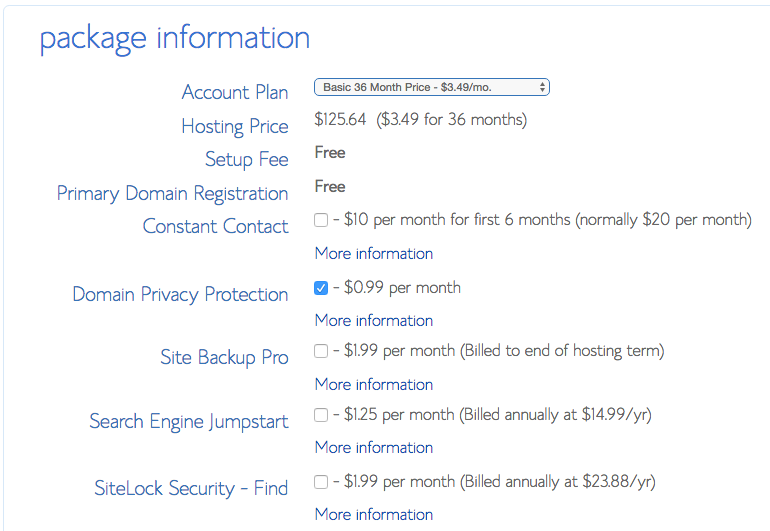 The basic plan on Bluehost starts out at only $3.49/month, which is perfect for someone just getting started. However, the Plus plan does have some additional perks, so it might be something to look into. 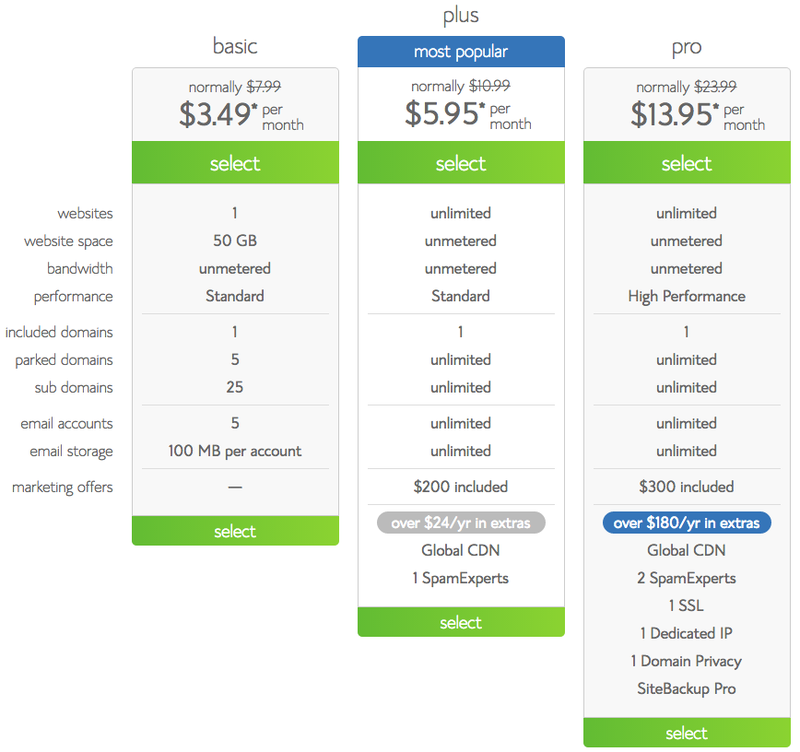 Whatever plan you choose, you can upgrade at any time and each plan does include a domain name, which is awesome. Click the SELECT button on the plan you choose and move to the next step. Now comes the fun part . . . you get to choose the web address of where people will find you! For us, our domain is www.SixSistersStuff.com. You can either choose a brand new name (enter it in on the left side) or if you have an existing domain, you can enter that also (enter it on the right side). Click the blue NEXT button. Make sure to enter in the correct email address, as this is where they will send you all your login info. Choose your Account Plan from the drop down menu. Make sure that you choose a package based on how far in advance you want to pay. Keep in mind that Bluehost bills a year at a time, but it breaks down to be the best monthly price with the highest quality service. Don’t worry about the add-ons . . . the only one that we would have you consider would be the Domain Privacy Protection, which keeps your personal information private. 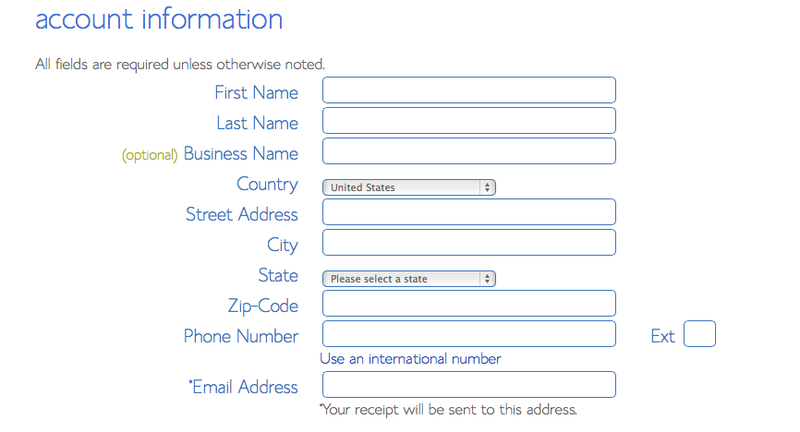 Put in your billing info, check the confirm box, and click on the blue NEXT button. You will get asked if you are interested in any upgrades, just skip them for now. Check your email and you should find a welcome email from Bluehost. In that email will be your Control Panel (cpanel) Login info. Keep this info in a safe place! Hooray! You have completed setting up hosting! Now it’s time to install WordPress. Login to your Bluehost and click on LOGIN in the upper right corner. 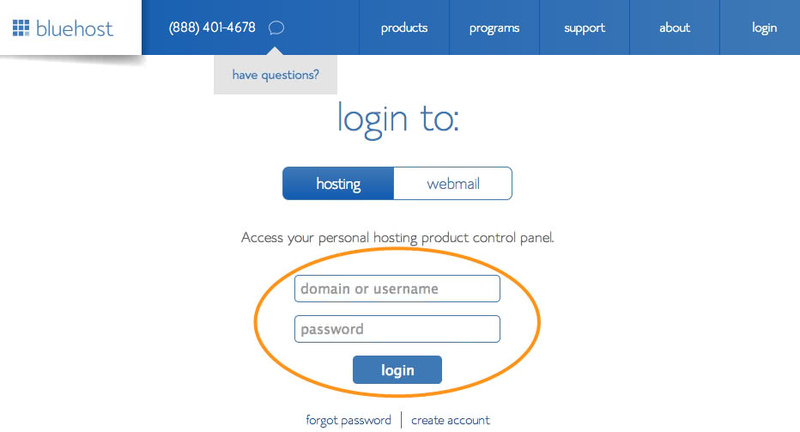 Enter your cpanel login info from the welcome email you just received. Make sure you are logging into hosting and not webmail. 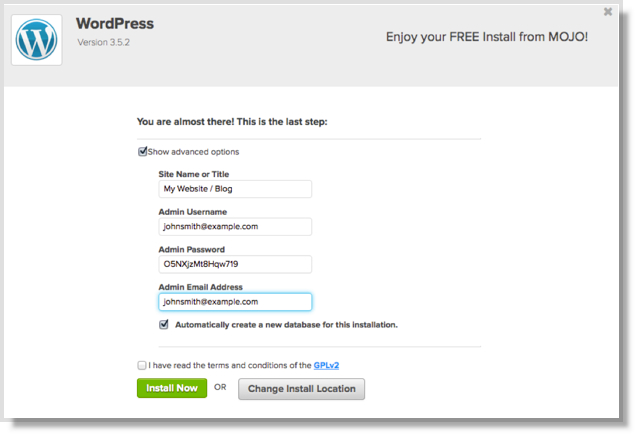 On your panel page, click the INSTALL WORDPRESS button in the middle of the screen. Click the green INSTALL button. Choose your domain from the drop down menu to show where you want to install WordPress, then click the green CHECK DOMAIN button. You can just leave the other field empty. Check the little box next to Show Advanced Options. Enter your site name or title – ours is Six Sisters’ Stuff. Choose an admin username, then choose an admin password – this will become the login info you use to sign into WordPress once it’s installed. 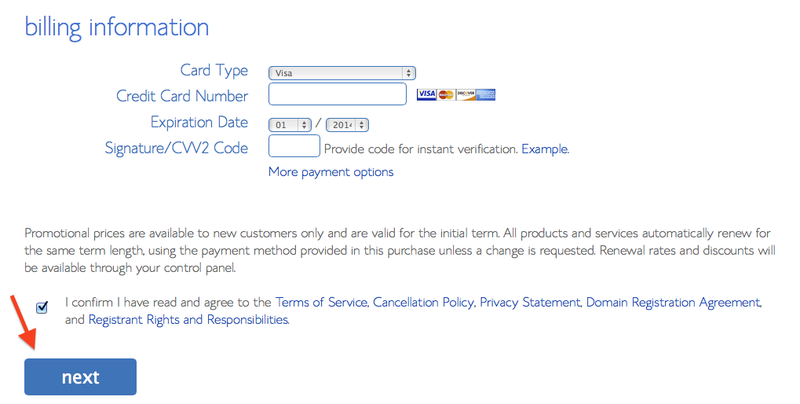 Enter your email address, click the box for terms and conditions, then click the green INSTALL NOW button. Once it’s done installing, you are now the proud owner of your own self-hosted website!! Congratulations! Start writing!! Share with the world whatever you want – it’s your blog! Or, you can give your website a more custom design by adding a THEME. We are not website designers by any means and HTML code is literally a foreign language to us, so we stuck with something simple and used the Genesis Framework as a base. Then to make it pretty, we recommend choosing a simple theme, like these ones from Designer Blogs. 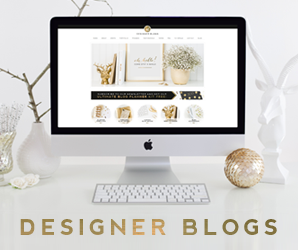 We have used Designer Blogs for a couple of projects and other websites and we highly recommend them. They are very reasonably priced and will even install it for you for free, so it’s worth every penny! Another great source for themes is Restored 316 – they have a great selection and are also reasonably priced with great customer service. If you are looking for a simple, clean, and beautiful design for your website, Restored 316 has some of the most gorgeous themes I have ever seen! They are pretty feminine, which may or may not work (depending on the type of site you are going for). For a more business-like look (or not so girly look), Template Express has an amazing selection and very clean designs. From here, it’s time to get to work. You could write a killer about page, you could add some things in your side bar, or start producing amazing content. Blogging is an incredible journey and we are so excited for you. When you are ready to GROW YOUR BLOG and start getting more traffic, get our FREE eBook – 5 Foolproof Ways to Grow Your Blog.